If you have added your employees but haven't yet invited them into CakeHR, then there is an easy way to send a mass-invitation. Go to Reports > Access log & you will find a few widgets showing your company login statistics. To invite everyone in one go, click on the green "SEND WELCOME EMAIL" button. Alternatively you can send invites to individual employees by clicking on the "SEND" button next to their name. Employees will receive a welcome email with a link which will lead to password setup page. 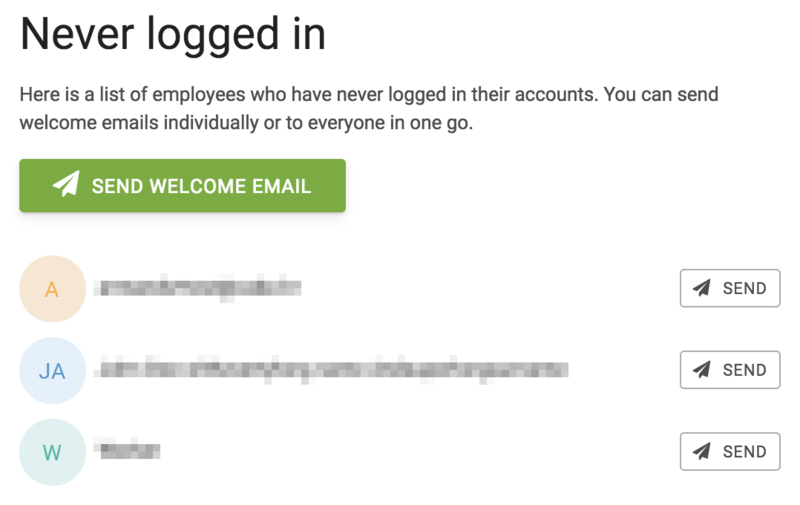 This way you don't have to think about their passwords - employees will set them up themselves (unless you have G Suite or other Single Sign On integration with CakeHR - then no password will be asked).